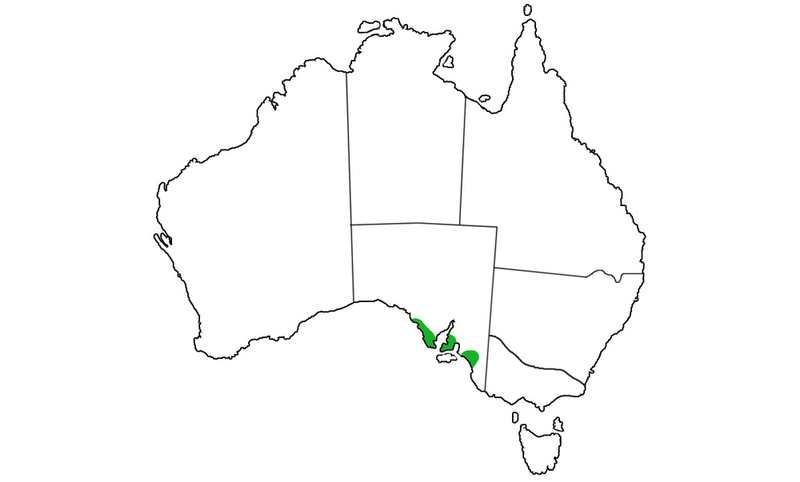 The Chappell Island Tiger Snake comes from Chappell Island in the Bass Strait. This is a very inhospitable place to live, and the Chappell Island Tiger has several adaptations to ensure its survival. The Islands in the Bass Strait are known for their severe winters. To counteract this, the dark colour of these snakes helps the animals warm quickly when lying in the sun. At night the snakes will take shelter in the burrows of the Mutton Birds that nest on the Island. During a brief breeding season of these Mutton Birds (2 to 3 months per year) is the only time the Chappell Island Tigers get to feed. The snakes' bodies have adapted to tolerate this gorge of oil from the chicks and then live off it for the remaining 9 to 10 months, until the next mutton bird season. There is no fresh water on this Island, so the snakes get their fluid either from their food, or by licking dew in the mornings. The Chappell Island Tiger Snake is recognised as the largest species of Tiger Snake, reaching a length of 2 metres. As with all Tiger Snakes the Chappell Island Tiger produces live babies, often in excess of 20. Because of the cold climate, it makes more sense for these animals to be live bearers - as the female regulates her temperature by basking or snuggling beside the Mutton Birds, she is also regulating the temperature of her offspring. The Chappell Island tiger snake is recognised as the largest species of tiger snake, reaching a length of 2 metres. These snakes are dark to warm up quickly in the sun as it is very cold on Chappell Island. The snakes' bodies have adapted to tolerate this gorge of oil from the chicks and then live off it for the remaining 9 to 10 months, until the next mutton bird season.